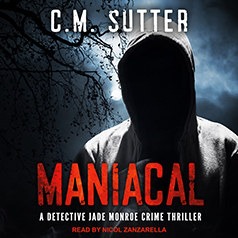 C. M. Sutter presents the first book in her Detective Jade Monroe Crime Thriller series. The newly promoted Sergeant Jade Monroe, and her partner, Detective Jack Steele, have just been informed of an unidentified male body found at a local lake. The town is in an uproar. The victim was nearly decapitated, and murder simply doesn't happen in North Bend. As more bodies turn up, the single connection between all of the victims becomes clear—it's Jade, herself.